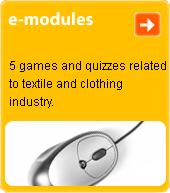 a collective term for clothing and clothing accessories which are used to cover the human figure. We distinguish between ladies', men's and children's clothing. As well as affording indispensable protection against winter and summer weather, clothing is also a statement of cultural maturity. Clothing can be divided into top garments, outerwear and underwear; everyday or occasional wear; spring-, summer-, autumn- and winterwear; civilian clothing and uniforms. It can be two-piece, multi-piece and combination. Vide also wear; apparel; garment.